Both James Foley, a freelance journalist who was reportedly beheaded by ISIS terrorists, and Steven Sotloff, a freelancer who has been threatened with execution, worked for Boston-based news organizations — Foley for GlobalPost, Sotloff for The Christian Science Monitor. On behalf of John and Diane Foley, and also GlobalPost, we deeply appreciate all of the messages of sympathy and support that have poured in since the news of Jim’s possible execution first broke. We have been informed that the FBI is in the process of evaluating the video posted by the Islamic State to determine if it is authentic. … We ask for your prayers for Jim and his family. The Monitor so far has only run an Associated Press article on Foley with no mention of Sotloff. Foley is from Rochester, New Hampshire, and the Union Leader reports on the local angle. So, too, do The Boston Globe and the Boston Herald. The Washington Post reports on the unique dangers faced by freelance journalists in an era when fewer and fewer news organizations have the resources to send staff reporters into conflict zones. Most journalists are like me: the biggest risk I take is that I might get overcharged for lunch. People like Foley and Sotloff — and all reporters and photographers who put themselves in harm’s way to bring back the story — are the true heroes of our craft. 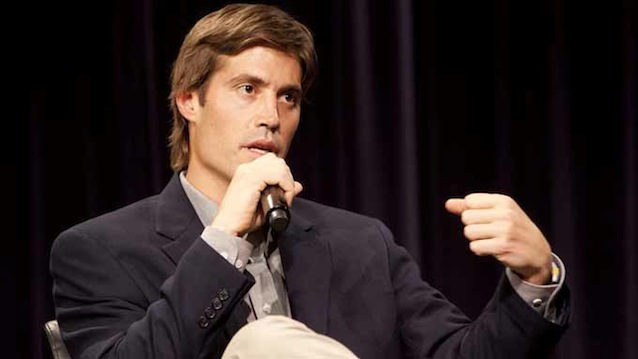 Photo via Northwestern University, where Foley spoke about his earlier captivity at the hands of Libyan militants. You are so right. The most dangerous thing I ever did as a journalist was criticize a politician or slam a government agency. Well, yeh, throw in an occasional snipe at Whitey Bulger (albeit from a distance) or pounding the pavement at a national nominating convention. The greatest risk to me was verbal attack or contempt, never physical danger. And yet Foley and others have done it time and again, disregarding their personal safety to go into combat zones and bring us the true story. The enduring truth is that we all owe them an enormous debt of gratitude. Sometimes I think of journalists who spoke at the Nieman Fellows dinner with SDX at Harvard. A Nieman Fellowship requires a reporter to return to his previous assignment after studying at Harvard, and some of these reporters were in harrowing situations. Tough work, dedicated people.